(Phys.org) —Researchers at Fudan University in China have discovered a way to speed up traditional computer transistors by embedding tunneling field-effect transistors (TFETs) in them. In their paper published in the journal Science, the team describes how embedding TFETs in such transistors allows for them to be run with less power, which in turn causes them to run faster. Most modern computers are run with either metal-oxide-semiconductor field-effect transistors (MOSFETs) or a variation of them called floating-gate (FG) MOSFETs. Such transistors are now reaching their physical limit as far as how thin they can be—just a few atoms thick. For that reason, researchers have been looking for other ways to get more bang for their buck. In this new effort, the researchers turned to TFETs, which use quantum tunneling to move electrons through very thin material. TFETs have traditionally been used in very low power devices. In this endeavor, they researchers created a TFET that could be used to control the electrodes that monitor the flow of electricity into a MOSFET—in this case, the floating-gate variety (it has an additional electrode gate that allows a charge to be retained). The idea is that if the gate could be made to open and close faster, the transistor as a whole would operate faster. Current chips require a build-up of charge before the gate can be opened or closed—which requires time. TFETs, because they require less power, don't take as long to do their work, thus embedding one in a floating gate-MOSFET would alleviate the necessity of power buildup prior to gate changes, allowing for quicker opening and closing. That's exactly what the team in China has done. Testing thus far has shown MOSFETs with embedded TFETs have improved transistor speeds as well as reduced power requirements. The team reports that because of the way their TFETs are constructed, embedding them in current model MOSFETs should not require reconfiguration or the use of any new materials. This means that the new TFET technology could be put into use almost immediately, bumping up the speed of computers and hand held devices while lessening the amount of energy used, resulting in longer battery life. As the semiconductor devices of integrated circuits approach the physical limitations of scaling, alternative transistor and memory designs are needed to achieve improvements in speed, density, and power consumption. 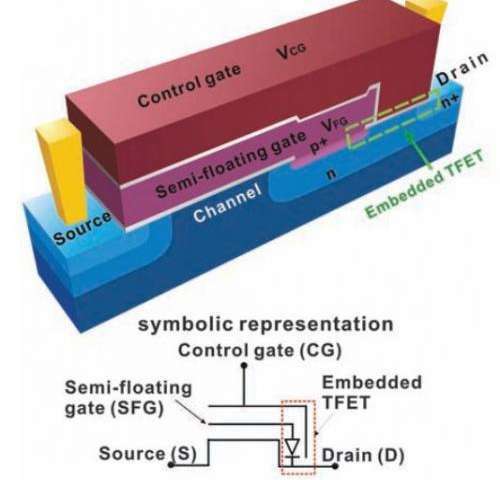 We report on a transistor that uses an embedded tunneling field-effect transistor for charging and discharging the semi-floating gate. This transistor operates at low voltages (?2.0 volts), with a large threshold voltage window of 3.1 volts, and can achieve ultra–high-speed writing operations (on time scales of ~1 nanosecond). A linear dependence of drain current on light intensity was observed when the transistor was exposed to light, so possible applications include image sensing with high density and performance. How dumb can you get in not providing answers to such questions as they are at the absolute core of the research. This transistor operates at low voltages (?2.0 volts), with a large threshold voltage window of 3.1 volts, and can achieve ultra–high-speed writing operations (on time scales of ~1 nanosecond). VendicarE one of the Net's most active sockpuppet account trolls, revealed by a Google search for VENDICAR BUSH. Well, this is about faster memory elements (transistors), not faster " traditional computer transistors". Floating gates are used in all kind of memories, and faster is better, but the article never mentioned the word memory when trying to explain what this is about. (the abstract does, and the picture does). Give it a 1. "VendicarE one of the Net's most active sockpuppet account trolls, revealed by a Google search for VENDICAR BUSH." Wow Nik --- you are becoming less coherent day by day. (and that's pretty incoherent given where you started) You should look in the mirror before you talk about trolls! Incoherent pronouncements, poor data sources, distorted interpretations, namecalling, wild accusations, lousy science, poor reading skills, arrogant as all hell, the list goes on. Those are just the facts (well, some of them). I could continue with my opinions, but everyone is welcome to form their own. Antipathy? Not surprised, given the theme of your own trolls. Mr. "meBigGuy" calls me arrogant? The slapstick of buffoonish numbskullery continues. I humbly admit in this thread that my copy of "Solids and Surfaces: A Chemist's View of Bonding in Extended Structures" by Roald Hoffmann was only read once since I couldn't grasp it all intuitively like I could the chess game of actually synthesizing materials. See, that's all it is about to you, Nik. You can humbly feel superior to anyone else by bashing them with part of the alphabet, making you magically right. Now, what those letters actually mean is you've studied to be an expert in an extremely narrow field. You, however, seem to take that as vindication for whatever happens to pop into your noggin as gospel from on high. I really hope you never try marijuana. Group therapy alert! This thread is truly creepy. Well, you know, Nik - one comment from one person is an errant opinion. Two or three comments from different people is something of a trend, but might not be indicative. When there's a consistent conflict, and it's the same one with many different people - maybe it's not them; maybe it's you. Hmm. I'm not sure if Nik is still trying to soothe his own ego that only one person opposes his positions and doesn't take his argument from authority as seriously as he'd like, or if someone else is just having fun. Either way, the point is a narcissist can always try and paint everyone else as worse/less than themselves due to their own burning feelings of inadequacy. It still doesn't make it true, or by contrast make them any better. You are all supposed to be grown ups. But you are unable to discuss the merits and failings of an interesting article without resorting to snark. Pfft.